Large transparent plastic beads are 25mm with 4mm holes. Whale, turtle, dolphin and seal shaped beads. approx 120 beads per 1/2-lb bag. Large beads make stringing easy. 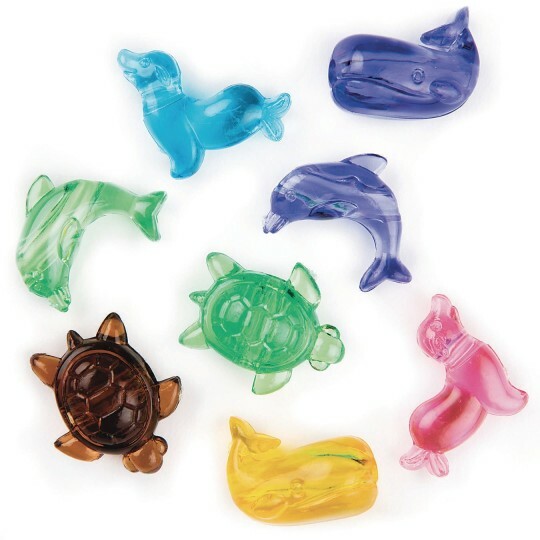 Whale, turtle, dolphin and seal shaped beads. Can be used with pony, crow or other beads. String with skinny S'Getti® . Approx imately 120 beads per 1/2-lb bag. 4mm hole. During our ocean week our pre-teens used these to make jewelry and oceans in a bottle. They worked well for both. Needed a quick craft that said summer for my Residents at a Nursing Center.Since site and fingers are not as nimble as they once were these colorful sea creatures were a joy to work with. So much so the residents wanted more than one. They were easy to string and most of the residents did them themselves. A great afternoon of fun was had by all. The kids love these beads because they are so big colorful and easy to string! With this year's ocean theme for VBS this will be a perfect craft for the middle and older elementary kids. Beautiful colors. Ages 4 and up. It is sooo hard to find scale miniatures. Thank you S S for providing a great selection!